Web maps and iPhone apps are a huge hit with knitters and quilters. A screenshot of the Quilt Shops web map. MapMuse today announced the release of its 2012 Knitting and Quilting Maps, a series of free web maps and review platforms for places of interest to knitters and quilters. Included among the maps are topics such as Fabric Stores, Knitting Clubs, Knitting and Yarn Stores, Quilt Stores, Quilting Guilds, and Knitting and Quilting Events. In addition, MapMuse has released the 2012 data updates to its “Quit Shop Locator” and “Knitting and Yarn Shop Locator” apps for the iPhone, iPad, and iPod Touch. In the interest of engaging the social aspect of knitting and quilting, MapMuse has also attempted to map all knitting and quilting clubs across the USA. The same goes for workshops, retreats, and trips. Each club and event is plotted on the map and given its own listing page, with the hope that knitters and quilters looking for like-minded craftspeople in the area will stumble across them. Although MapMuse has no association with any clubs or events, they still strive to make sure all of their data is kept current. “A good amount of work goes into keeping everything up to date,” says Pilon. Most maps are updated on a semi-annual basis by MapMuse, although they’re constantly being refined by the craft community. Knitters and Quilters with iPhone, iPads, and iPod touches can also access the maps via their mobile device. The Quilt Shop Locator and Knitting and Yarn Shop locator sell for $2.99 apiece on the iTunes App Store. Similar to the web maps, users are encouraged to submit ratings, reviews, and photos of locations directly from their mobile devices. Other handy features include driving directions via Google Maps, one-touch dialing and emailing, and the addition of major crafts chains to the map such as Joann Fabric and Craft Stores. 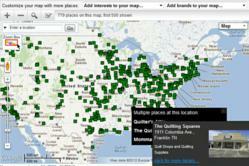 To view a complete list of MapMuse’s Knitting and Quilting maps, please visit http://www.mapmuse.com/knittingandquilting. For more information on MapMuse, please visit their homepage at http://www.mapmuse.com.